Drove up Signal Mountain for good views in the morning. After a stop at Jenny Lake overlook, we set off for Livingston. Driving back through Yellowstone, we got caught in a traffic jam caused by a black bear, which we caught a glimpse of. Ate dinner at a Dairy Queen in Livingston. Got donuts for breakfast from a grocery store. Continued our drive, I lost another tooth after lunch. Arrived at Glacier in the late afternoon and stopped in at a visitor center. Walked to dinner at the Many Glacier Hotel. Not very good. We passed a moose walking back to our cabin. Also went to a ranger program on wolves. After breakfast, we set out for a long day on the Going-to-the-Sun Road (more like "Going-to-the-Clouds Road", considering the weather that day). Despite the clouds, the views were amazing. 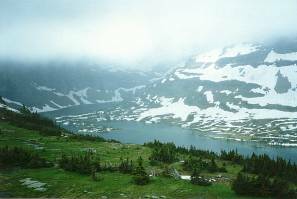 Stopped and did a three mile walk to an overlook of Hidden Lake. A mountain goat followed us around at the overlook for a while. Before returning to the car, we looked around Logan Pass Visitor Center at the trailhead. We continued our drive, which proved to be very scenic. At the far end of the road, we went to a program featuring a 5-mile hike and discussion about national parks. The destination was Eagle's Lookout, where eagles used to wait in a tree looking for salmon to eat. Went to dinner at the Park Caf�, I had a tostada and huckleberry ice cream. Very good. We saw a bear on the road side while driving back to the cabin.